Various imidazole antifungal drugs such as clotrimazole have been claimed to inhibit Candida growth. Moreover, triazoles such as fluconazole represent the wide spectra of antifungal activity against fungi. Although azole antifungals are members belonging to the same class of antifungal drugs, they represent largely different chemical properties which impact the pharmacokinetics and spectrum of activities. All azole antifungals inhibit the function of the cytochrome P450 system to some degree of specificity., The increasing rate of azole drug-resistance of C. tropicalis has been documented. The number of antifungal agents is limited and their mostly fungistatic activity facilitates selection of antibiotic-resistant strains.,, Thus, advances in the development of candidiasis therapies have focused on the use of antifungal agents in combination. In this study, we first investigated the antifungal susceptibilities to fluconazole alone and in combination with clotrimazole using the broth microdilution method interpreting the synergistic effects by the fractional inhibitory concentration (FIC) index model. Finally, the antifungal effect of fluconazole in combination with clotrimazole on expression levels of ALS1, ALS2, LIP1, LIP4, SAP2, and SAP4 genes in C. tropicalis were examined. Candida tropicalis ATCC 750 and ten infected clinical isolates obtained from recurrent (defined as 3 or more per year) vulvovaginal candidiasis patients who had previously used clotrimazole in the past 5 years were used in this study. All isolates were maintained on Sabouraud Dextrose Broth (Merck Research Laboratories, Darmstadt, Germany). Before experiments, the isolates were grown overnight at 35°C on Sabouraud Dextrose Agar (Merck Research Laboratories) plates. The antifungal agents used in the present study, i.e., fluconazole and clotrimazole, were purchased from Sigma-Aldrich Co. (St. Louis, MO, USA). The antifungal agents were then dissolved and the stock solutions were diluted based on CLSI M27-A3 guidelines. The C. tropicalis cell density of five colonies more than 1 mm in diameter of propagated cells, suspended in 5 ml sterile phosphate-buffered saline was estimated through measurement of the optical density at 530 nm. The cell suspension measured at OD530 was made in Roswell Park Memorial Institute-1640 medium (Sigma-Aldrich) and prepared in accordance with CLSI M27-A3 guidelines. Briefly, the cell suspension (a concentration of 1–5 × 106 colony-forming units (CFU)/ml) was diluted to 5 × 102–2.5 × 103 CFU/ml and the viability of the yeast cells was measured through the viable pour plate counting method. Quantitative real-time reverse transcription polymerase chain reaction (qRT-PCR). The qRT-PCR analysis was based on the procedure previously described. The inoculum of 1-5 × 106 CFU/ml C. tropicalis ATCC 750 strain was treated with fluconazole alone and in combination with clotrimazole at concentrations of 2 × MIC and 1 × MIC. Next, the mixture under study was pelleted at 3000 rpm for 10 min. For each treatment, the total RNA was extracted using the RNeasy Mini Kit (Qiagen, Hilden, Germany), according to the manufacturer's recommended protocol. The RNA quality was observed using the formaldehyde-denaturing agarose gel electrophoresis. The OD260/280 and OD260/230 were measured with a NanoDrop Spectrophotometer ND-1000 (NanoDrop Technologies Inc., Wilmington, DE). RNAse-free DNase I (Fermentas, USA) was used for the removal of genomic DNA contamination. 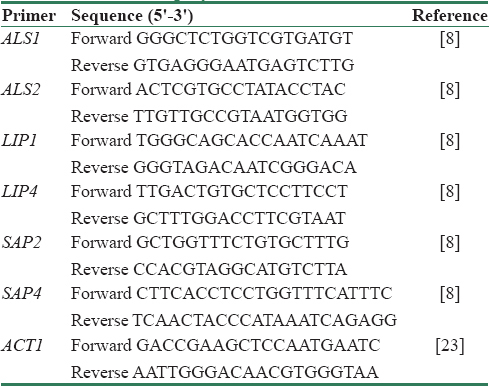 Single-stranded cDNA was synthesized using M-MuLV reverse transcriptase and random hexamer oligonucleotides (Fermentas, USA) in accordance with the manufacturer's instructions. The synthesized cDNA formed in each treatment was amplified with primers [Table 1] by PCR using ™SYBR Green qPCR Master Mix (Fermentas, EU) in a Bio-Rad MiniOpticon™ system (USA). The cycling conditions included an initial step at 50°C for 2 min; holding at 95°C for 10 min, 40 cycles of denaturation at 95°C for 15 s and subsequently annealing at 55°C for 1 min. Finally, the melting reaction occurred at 72°C–99°C. The results from amplifications were quantified by the Pfaffl method. The Research Ethics Committees of our institute, Islamic Azad University of Yasooj, Iran (Ethical code 1213342) approved the study. The study protocol conformed to the ethical guidelines of the 2008 Declaration of Helsinki. Informed consent was obtained from patients. Results represent the mean of the three independent experiments ± standard deviations. Data were subjected to analysis of variance. The comparison of two means was calculated using the Tukey's post hoc test. Value of P ≤ 0.05 was considered statistically significant. Statistical analyses were performed using the software SPSS 21.0 for Windows (SPSS Inc. Chicago, IL, USA). The age range of studied patients was 23–48 years old. The overall isolation rate of Candida species from vulvovaginal samples was 93.50%. The incidence rate of C. tropicalis was found in 10 of 187 (5.35%) of Candida species. The antifungal effect assay setup was based on CLSI guidelines for the broth microdilution assay and the MICs of fluconazole alone and in combination with clotrimazole was determined against C. tropicalis [Table 2]. From among the 10-infected clinical isolates of C. tropicalis, 6 (60%) were resistant to fluconazole (MIC ≥8 μg/ml) and 10 (100%) were resistant to clotrimazole (MIC ≥1 μg/ml). A comparison between these values for fluconazole alone and in combination with clotrimazole against C. tropicalis showed that the combination of fluconazole with clotrimazole can be decreased from its MIC value. 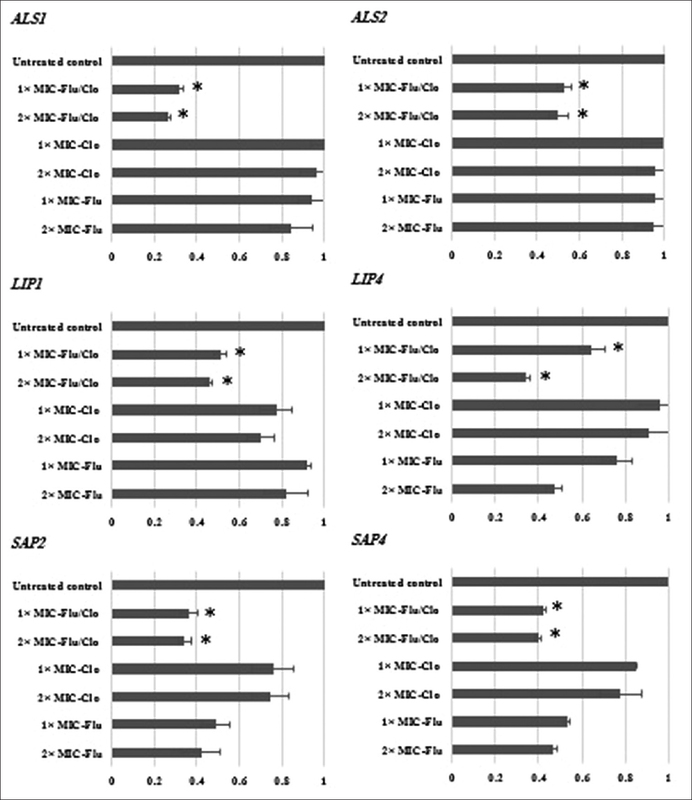 It is also noteworthy to mention that the FIC index values of all C. tropicalis tested (100%) were synergistic effects (FIC ≤ 0.5) in the presence of fluconazole in combination with clotrimazole. Fluconazole exhibits synergy with clotrimazole with a FIC90 index ranged from 0.011 to 0.43 in C. tropicalis isolates. The analysis of the effect of fluconazole alone and in combination with clotrimazole against C. tropicalis ATCC 750 on their expression levels of ALS1, ALS2, LIP1, LIP4, SAP2, and SAP4 genes revealed that the overall genes expression levels of the treatments differed significantly (P < 0.05). The results of the qRT-PCR analysis showed that fluconazole alone caused down-regulation in the expression levels of SAP2, SAP4 and LIP4 (P < 0.05) and the expression levels of ALS1, ALS2, and LIP1 represented no significant changes (P = 0.20). The expression of LIP1, LIP4, SAP2, and SAP4 genes was decreased on clotrimazole challenge. The combination of fluconazole with clotrimazole showed down-regulation of genes compared to the untreated control (P < 0.05; [Figure 1]). The results showed that fluconazole in combination with clotrimazole at concentrations of 2 × MIC and 1 × MIC down-regulated the expression levels of ALS1 by 3.75- and 3.13-fold and ALS2 by 2.00- and 1.89-fold, respectively (P < 0.05). The expression levels of LIP1 and LIP4 genes were down-regulated by 2.18- and 1.95-fold and 2.90- and 1.55-fold in C. tropicalis treated with 2 × MIC and 1 × MIC of fluconazole in combination with clotrimazole, respectively (P < 0.05). The expression level of SAP2 was down-regulated by 2.91- and 2.74-fold and SAP4 down-regulated by 2.51- and 2.038-fold with 2 × MIC and 1 × MIC of fluconazole in combination with clotrimazole treatment, respectively (P < 0.05). However, the combination of fluconazole with clotrimazole could cause a down-regulation of gene expression of ALS1, SAP2, LIP4, SAP4, LIP1, and ALS2 genes, respectively (P < 0.05). Azoles are the initial treatment of choice for antifungal treatment of candidiasis. Nevertheless, the development of antifungal resistance, drug-drug interactions, and severe side effects/toxicities has limited their effective therapeutic for fungal diseases. Therefore, the development of the effectiveness and acceptability therapeutic strategies for fungal diseases is warranted to overcome antifungal agent resistance and its side effect/toxicity.,, In the present study, we observed significant results of resistance to clotrimazole in infected clinical isolates of C. tropicalis obtained from recurrent vulvovaginal candidiasis patients with previous exposure to clotrimazole. Similar results were obtained by Pelletier et al. for the HIV-infected pediatric population receiving this azole. Diaz et al. showed resistance to clotrimazole of vaginal C. tropicalis isolates. The results from the present research show that fluconazole in combination with clotrimazole exhibit potent antifungal synergy against all clinical isolates of C. tropicalis. Combination therapy of fluconazole with clotrimazole was as effective as single dose fluconazole in vulvovaginal mycoses. Gharibi et al. evaluated the effectiveness of fluconazole and clotrimazole combination in the treatment of recurrent vaginal candidiasis caused by C. albicans. They observed that for the treatment of patients with recurrent vulvovaginal candidiasis, fluconazole in combination with clotrimazole can be more effective than other treatments. Our results show that in vitro combination of fluconazole with clotrimazole could be effective against C. tropicalis. The gene expression analysis of C. tropicalis treated with fluconazole alone and in combination with clotrimazole revealed that fluconazole in combination with clotrimazole could down-regulate the expression levels of genes. The results from the present research also revealed that the expression levels of ALS1, ALS2, LIP1, LIP4, SAP2, and SAP4 were affected by fluconazole in combination with clotrimazole in C. tropicalis which is in agreement with the recent experimental results of Khodavandi et al. The findings revealed that fluconazole in combination with amphotericin B significantly down-regulated the expression of PLB and SAP2 genes in C. tropicalis. Moreover, the expression levels of ALS1 and ALS2 differed significantly in C. tropicalis treated with the combination of the two azoles. This may occur due to distinct adherence and biological functions of ALS family genes. Research suggests that the ALS family form important adhesion molecules for C. tropicalis pathogenicity.,, Roudbarmohammadi et al. investigated the expression of ALS1 and ALS3 genes in C. albicans isolated from vulvovaginal candidiasis. The results indicated that the expression of ALS1 and ALS3 genes was greater than that of the control group. Our results showed that fluconazole alone and in combination with clotrimazole can induce changes in the expression levels of hydrolytic enzymes (LIP1, LIP4, SAP2, and SAP4), which are recognized as important virulence factors for C. tropicalis pathogenicity.,,, Our results consistent with those obtained by Gu et al., who showed that the combinations of fluconazole with fluoxetine cause a down-regulation of gene expression of SAP1-4 C. albicans strains. The expression of virulence genes (ALST1-3, LIP1, LIP4, and SAPT1-4) was investigated in C. tropicalis strains with diverse virulence. RT-PCR analysis showed that the expression of virulence genes was significantly different in the corresponding genes for most C. tropicalis. Stehr et al. investigated the expression pattern of LIP1–LIP10 genes in C. albicans during experimental infections and in samples of patients with oral candidiasis. The findings of Stehr et al. showed that individual lipase genes were differentially expressed in a mouse model of systemic candidiasis and in human specimens. Khodavandi et al. showed that the expression of SAP4 gene was down-regulated in C. albicans treated with fluconazole. This study illustrates the potent synergist activity of fluconazole in combination with clotrimazole against C. tropicalis demonstrating the down-regulation of ALS1, ALS2, LIP1, LIP4, SAP2, and SAP4 genes in C. tropicalis treated with fluconazole in combination with clotrimazole, as assessed in the qRT-PCR assay. Further research needs to be conducted to ascertain whether these events reflect the potential of fluconazole in combination with clotrimazole for the inhibition of virulence factors of C. tropicalis which differentially expresses specific gene. However, the present research demonstrated that the antifungal effect of fluconazole in combination with clotrimazole could be of great significance for the development of therapeutic strategies against resistant C. tropicalis. The authors would like to thank the Islamic Azad University of Yasooj for financial support. The results presented in this study are part of the Master thesis (1213342). Giri S, Kindo AJ, Kalyani J. Candidemia in intensive care unit patients: A one year study from a tertiary care center in South India. J Postgrad Med 2013;59:190-5. Forastiero A, Mesa-Arango AC, Alastruey-Izquierdo A, Alcazar-Fuoli L, Bernal-Martinez L, Pelaez T, et al. Candida tropicalis antifungal cross-resistance is related to different azole target (Erg11p) modifications. Antimicrob Agents Chemother 2013;57:4769-81. Kaur R, Dhakad MS, Goyal R, Kumar R. Emergence of non-albicans Candida species and antifungal resistance in intensive care unit patients. Asian Pac J Trop Biomed 2016;6:455-60. Zuza-Alves DL, Silva-Rocha WP, Chaves GM. An update on Candida tropicalis based on basic and clinical approaches. Front Microbiol 2017;8:1927. Nikawa H, Nishimura H, Hamada T, Sadamori S. Quantification of thigmotropism (contact sensing) of Candida albicans and Candida tropicalis. Mycopathologia 1997;138:13-9. Haynes K. Virulence in Candida species. Trends Microbiol 2001;9:591-6. Yu S, Li W, Liu X, Che J, Wu Y, Lu J, et al. Distinct expression levels of ALS, LIP, and SAP genes in Candida tropicalis with diverse virulent activities. Front Microbiol 2016;7:1175. Butler G, Rasmussen MD, Lin MF, Santos MA, Sakthikumar S, Munro CA, et al. Evolution of pathogenicity and sexual reproduction in eight Candida genomes. Nature 2009;459:657-62. Zaugg C, Borg-Von Zepelin M, Reichard U, Sanglard D, Monod M. Secreted aspartic proteinase family of Candida tropicalis. Infect Immun 2001;69:405-12. Silva S, Negri M, Henriques M, Oliveira R, Williams DW, Azeredo J, et al. Adherence and biofilm formation of non-Candida albicans candida species. Trends Microbiol 2011;19:241-7. Richardson JP, Ho J, Naglik JR. Candida-epithelial interactions. J Fungi (Basel) 2018;4. pii: E22. Pappas PG, Kauffman CA, Andes DR, Clancy CJ, Marr KA, Ostrosky-Zeichner L, et al. Clinical practice guideline for the management of candidiasis: 2016 update by the infectious diseases society of America. Clin. Infect. Dis2 016;62:e1-50. Khodavandi A, Alizadeh F. Antifungal Agents and Their Mechanism of Action. 1st ed. Iran: Islamic Azad University; 2017. Kołaczkowska A, Kołaczkowski M. Drug resistance mechanisms and their regulation in non-albicans Candida species. J Antimicrob Chemother 2016;71:1438-50. Campitelli M, Zeineddine N, Samaha G, Maslak S. Combination antifungal therapy: A Review of current data. J Clin Med Res 2017;9:451-6. Alizadeh F, Khodavandi A, Esfandyari S, Nouripour-Sisakht S. Analysis of ergosterol and gene expression profiles of sterol Δ5,6-desaturase (ERG3) and lanosterol 14α-demethylase (ERG11) in Candida albicans treated with carvacrol. J Herbmed Pharmacol 2018;7:79-87. Clinical and Laboratory Standards Institute. Reference Method for Broth Dilution Antifungal Susceptibility Testing of Yeasts; Approved Standard M27-A3. Wayne, PA: Clinical and Laboratory Standards Institute; 2008. Clinical and Laboratory Standards Institute. Reference Method for Broth Dilution Antifungal Susceptibility Testing of Yeasts; Informational Supplement M27-S4. 4th ed. Wayne, PA: Clinical and Laboratory Standards Institute; 2012. Khodavandi A, Alizadeh F, Aala F, Sekawi Z, Chong PP.In vitro investigation of antifungal activity of allicin alone and in combination with azoles against Candida species. Mycopathologia 2010;169:287-95. Khodavandi A, Alizadeh F, Vanda NA, Karimi G, Chong PP. Possible mechanisms of the antifungal activity of fluconazole in combination with terbinafine against Candida albicans. Pharm Biol 2014;52:1505-9. Khodavandi A, Harmal NS, Alizadeh F, Scully OJ, Sidik SM, Othman F, et al. Comparison between allicin and fluconazole in Candida albicans biofilm inhibition and in suppression of HWP1 gene expression. Phytomedicine 2011;19:56-63. Silva S, Hooper SJ, Henriques M, Oliveira R, Azeredo J, Williams DW, et al. The role of secreted aspartyl proteinases in Candida tropicalis invasion and damage of oral mucosa. Clin Microbiol Infect 2011;17:264-72. Cuenca-Estrella M. Combinations of antifungal agents in therapy – What value are they? J Antimicrob Chemother 2004;54:854-69. Ostrosky-Zeichner L. Combination antifungal therapy: A critical review of the evidence. Clin Microbiol Infect 2008;14 Suppl 4:65-70. Johnson MD, Perfect JR. Use of antifungal combination therapy: Agents, order, and timing. Curr Fungal Infect Rep 2010;4:87-95. Kauffman CA. Role of azoles in antifungal therapy. Clin Infect Dis 1996;22 Suppl 2:S148-53. Wiederhold NP. Antifungal resistance: Current trends and future strategies to combat. Infect Drug Resist 2017;10:249-59. Pelletier R, Peter J, Antin C, Gonzalez C, Wood L, Walsh TJ, et al. Emergence of resistance of Candida albicans to clotrimazole in human immunodeficiency virus-infected children:In vitro and clinical correlations. J Clin Microbiol 2000;38:1563-8. Diaz MC, Camponovo R, Araya I, Cerda A, Santander MP, Carrillo-Muñoz AJ, et al. Identification and in vitro antifungal susceptibility of vaginal Candida spp. Isolates to fluconazole, clotrimazole and nystatin. Rev Esp Quimioter 2016;29:151-4. Mendling W, Krauss C, Fladung B. A clinical multicenter study comparing efficacy and tolerability of topical combination therapy with clotrimazole (Canesten, two formats) with oral single dose fluconazole (Diflucan) in vulvovaginal mycoses. Mycoses 2004;47:136-42. Gharibi T, Ganjoo M, Kamali F, Ahmadi S, Pouladi S, Vahed Parast H, et al. Comparison of combined use of fluconazole and clotrimazole with the sequential dose of fluconazole in the treatment of recurrent Candida vaginitis. Iran South Med J 2009;12:34-9. Khodavandi A, Alizadeh F, Jafarzadeh M. Synergistic interaction of fluconazole/amphotericin B on inhibition of enzymes contributes to the pathogenesis of Candida tropicalis. Pharm Sci 2018;24:280-90. Roudbarmohammadi S, Roudbary M, Bakhshi B, Katiraee F, Mohammadi R, Falahati M, et al. ALS1 and ALS3 gene expression and biofilm formation in Candida albicans isolated from vulvovaginal candidiasis. Adv Biomed Res 2016;5:105. Gu W, Guo D, Zhang L, Xu D, Sun S. The synergistic effect of azoles and fluoxetine against resistant Candida albicans strains is attributed to attenuating fungal virulence. Antimicrob Agents Chemother 2016;60:6179-88. Stehr F, Felk A, Gácser A, Kretschmar M, Mähnss B, Neuber K, et al. Expression analysis of the Candida albicans lipase gene family during experimental infections and in patient samples. FEMS Yeast Res 2004;4:401-8. Khodavandi A, Alizadeh F, Harmal NS, Sidik SM, Othman F, Sekawi Z, et al. Expression analysis of SIR2 and SAPs1-4 gene expression in Candida albicans treated with allicin compared to fluconazole. Trop Biomed 2011;28:589-98.